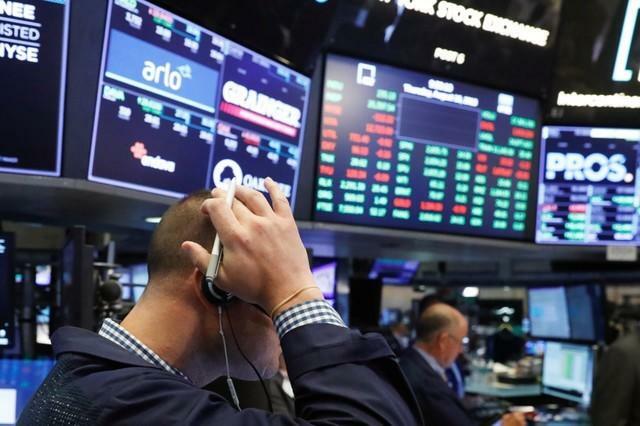 NEW YORK (Reuters) - U.S. stocks rebounded on Thursday with the Dow posting its biggest percentage gain in over four months, as positive earnings and waning trade jitters buoyed investor confidence. 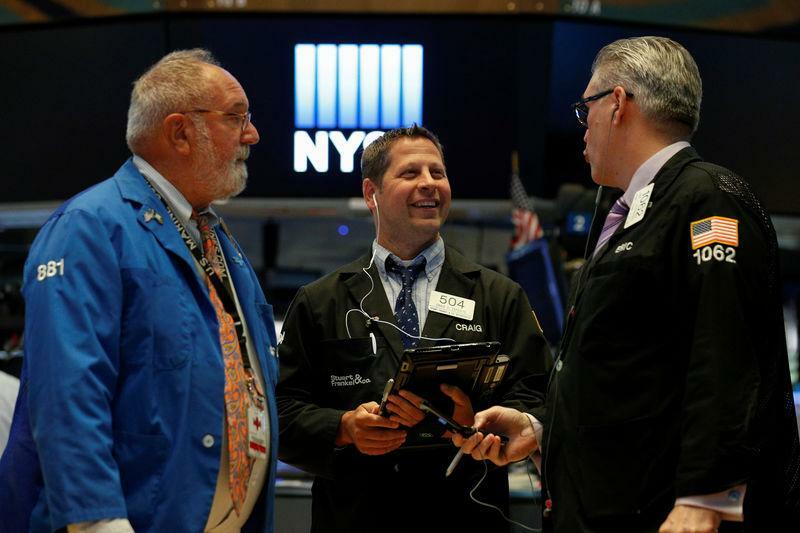 A broad rally pulled all three major U.S. indexes higher following Wednesday's sell-off. Walmart Inc (WMT.N) shares jumped 9.3 percent after the world's largest retailer topped earnings estimates and posted its best same-store sales growth in a decade. Easing trade tensions gave relief to tariff-vulnerable industrials, which led the Dow Jones Industrial Average's advance. Boeing (BA.N) and Caterpillar (CAT.N) ended the session up 4.3 percent and 3.2 percent, respectively. The S&P 500 industrial sector (.SPLRCI) gained 1.2 percent. Escalating tariff rhetoric cooled down on news that Beijing will send a delegation to Washington to help resolve the growing trade conflict between the world's two largest economies. "The market's getting a boost with some prominent companies coming in with some decent earnings, such as Walmart," said Chuck Carlson, chief executive officer at Horizon Investment Services in Hammond, Indiana. "But I think this also shows the schizophrenic nature of the market when short-term market action is pegged so closely to trade wars and tariff talks, especially with China." The Dow Jones Industrial Average (.DJI) rose 396.32 points, or 1.58 percent, to 25,558.73, the S&P 500 (.SPX) gained 22.32 points, or 0.79 percent, to 2,840.69 and the Nasdaq Composite (.IXIC) added 32.41 points, or 0.42 percent, to 7,806.52. All 11 major sectors of the S&P 500 ended the session higher, with telecom (.SPLRCL) and consumer staples (.SPLRCS) posting the largest percentage gains. Second-quarter reporting season is winding down. With 463 of S&P 500 companies having posted earnings, 79.3 percent have exceeded analyst estimates, according to Thomson Reuters I/B/E/S. Cisco Systems Inc (CSCO.O) stock rose 3.0 percent after beating Wall Street revenue and profit targets. Cyber security firm Symantec Corp (SYMC.O) ended a five-day slide, advancing 4.6 percent after hedge fund Starboard Value LP bought a 5.8 percent stake in the company. Among losers, shares of J.C. Penney Co Inc (JCP.N) posted an all-time closing low, plunging 27.0 percent after it posted disappointing results and forecast a worse-than-expected full-year loss. Advancing issues outnumbered declining ones on the NYSE by a 2.97-to-1 ratio; on Nasdaq, a 2.40-to-1 ratio favored advancers. The S&P 500 posted 33 new 52-week highs and four new lows; the Nasdaq Composite recorded 91 new highs and 69 new lows. Volume on U.S. exchanges was 6.39 billion shares, compared with the 6.53 billion-share average for the full session over the last 20 trading days. Is Seacor (CKH) Stock Undervalued Right Now?